This was a branch of the Zizzi chain on Shad Thames near Tower Bridge. It closed down in 2015 and was replaced by a branch of Valentina deli, which later closed in turn. Zizzi is a chain of Pizza Express style Italian restaurants. 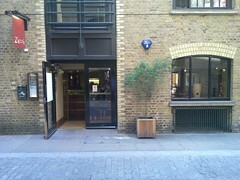 This is the branch on Shad Thames near Tower Bridge. secretlondon and some colleagues came here one Friday night in July 2009 after a few beers locally. We had some garlic bread with cheese (which arrived with the pizza) (£4.55) and secretlondon had a diavola pizza (£8.75). secretlondon remembers thinking that they were stingy with the cheese. It was averagey, unexciting. Last visited by secretlondon, July 2009. Last edited 2019-04-16 10:57:58 (version 8; diff). List all versions. Page last edited 2019-04-16 10:57:58 (version 8).